Want to try a snack that's bound to make you LOL? The Poop Emoji Tin filled with candy does just that. 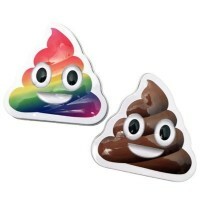 Will you get the bright rainbow Poop Emoji or the classic brown Poop Emoji? No what matter what, you're guaranteed to get a thrill from the deliciously sweet and crunchy candy inside this collectable tin. Note: Tin colors will vary between brown and rainbow. Order other products from the American brand : Boston American Corp.
Dextrose, maltodextrin, thickening agent E572, artificial flavor, color E150. Contains GMO. Nutrition facts (for 100g): calories 357Kcal, total fat 0g (saturated fat 0g), total carbohydrate 107.1g (sugar 107.1g), protein 0g, salt 0g.